We can't believe the summer is over and school is back in session. Some of the highlights of our summer with Green Team were: realizing that weeds keep coming back and that every time we visited our gardens there would be more weeds to combat, star gazing in Vermont, and working at a farm to benefit Lawrence food pantries. Another highlight for one of our very own members, Winnie, was getting 3rd place in a very competitive youth essay contest. Here are some of Winnie's award winning words: "I started working for Groundwork Lawrence Green Team this summer and it has changed the way I view things around me. It has taught me how I can live more practical, how to eat healthier food, how to maintain not only my community but other places around me. Green Team has been a really good opportunity to learn new things I wouldn't have tried on my own. I've learned how to tell plants from one another, and how to make healthier meals." Please visit the website in a couple of weeks to see the latest edition of our Green Team newsletter that will have more detailed information about what we did this past summer. Learn more about Green Team. The Downtown Lawrence Farmers Marketcontinues every Wednesday through October 28 from 8 - 2. Come buy your fruits, vegetables, local eggs, and honey at Appleton Way. We accept WIC, EBT, and credit (as well as cash). With the recently completed Manchester Street Park the city has doubled the number of garden plots and we now have community garden space available for the first time in a long time! Now is a great time to plant fall crops like kale, carrots, beets, spinach or lettuce (for example). You can also still get a warm weather crop of fast gowing veggies like radishes, lettuce or turnips! If you are interested in your own space to garden at Manchester Street Park contact Janel. A New Way to Support GWL! Link your Shaw's Rewards Card to our Shaw's Fundraising ID number - 49001022652 - by visiting the Shaw's Community Rewards website and clicking "login or register with your Rewards Card First." Shaw's will contribute 1% of eligible Rewards Card purchases made to GWL. Even though this summer has felt shorter than normal, here in Lawrence it has been an exciting and busy season and we have many highlights to share with you. First, we would like to thank our two great su mmer interns, Yashira, a previous Green Team member, and Kemi, a Forest Foundation intern, for all of their hard work supporting the Lawrence Farmers Market and CSA. Also, we want to say thank you and goodbye to Rowan, Healthy Communities AmeriCorps*Vista, who just complete her year of service with GWL. Rowan brought great energy and passion to our Community Food Programs and we wish her the best of luck in her new job in DC. 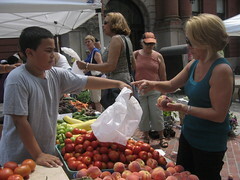 With the first half of the harvest season behind us, we are excited to report that the Lawrence Farmers Market has seen an increase in EBT (SNAP/food stamps) and WIC Farmers Market coupon sales and that the CSA has already donated 3,000 lbs of fresh, local produce to Neighbors in Need (NIN), manager of 7 local food pantries. This donation of much needed fresh produce is made possible through GWL's Share-A-Share program and the generosity of our CSA members. We look forward to continuing to donate a share of the harvest to those in Lawrence wh o lack the resources to afford fresh, local food and to surpassing last year's donation of 4,774 lbs. 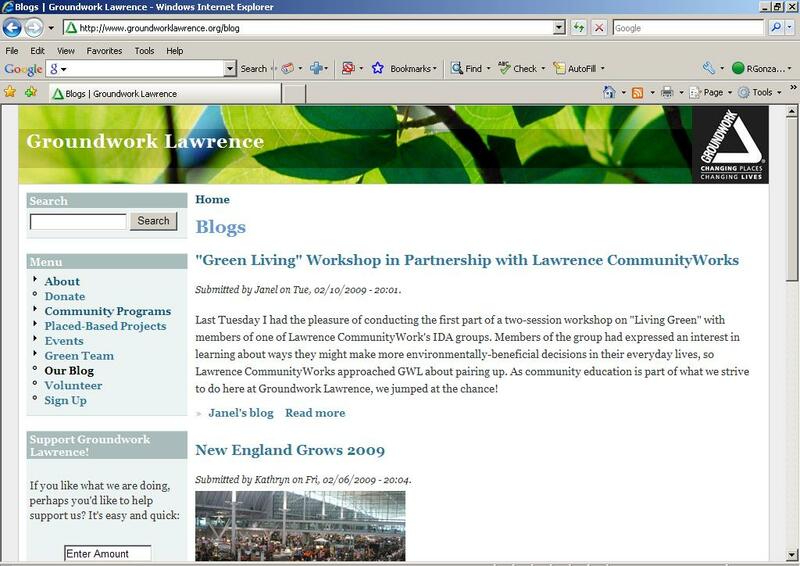 Another way that GWL is meeting Lawrence's need for affordable fresh produce is by managing a network of community gardens. This past July we organized a volunteer event to build 30 community garden beds at the newly completed Manchester Street Park. This new garden site more than doubles the number of garden plots available in the city and we hope you will come can check out the beds in person at the park's ribbon cutting ceremony this Wednesday, September 16 or through photos on Flickr! This summer, our community education and events programming included the annual Kite Festival, a Family Fiesta, an event offered in partnership wit h Family Services, Lawrence Heritage State Park and the Lawrence Summer Meals program. Held at Pemberton Park, the Kite Festival drew the largest crowd to-date - over 400 kites were provided for free to local youth to learn to use and enjoy. As we look towards the fall, on October 11 we hope you'll join GWL and our Green Team at Canal Illuminations, a family-friendly festival centered around Lawrence's historic North Canal. This LiveLawrence! event celebrates Hispanic Heritage Month and will feature music, dance and other entertainment that reflects the diverse Latino community in Lawrence. Also this fall we hope you'll continue to shop at the Lawrence Farmers Market which continues through the end of October and join us during Trails and Sails. As December approaches please keep your eye out for our GLOW Gala invitation. We've released the Eco-Art Call to Artists seeking treasures from local artisans (both professional and not) for the Gala's silent auction. 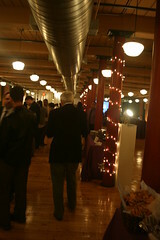 You can check out pictures of Glow and the art from years' past on Flickr. As you read on about upcoming GWL activities, please consider making a donationto support our work of "changing places, changes lives." Your donation enables us to create the building blocks of a healthy community while empowering Lawrence residents to improve their quality of life. We look forward to seeing you soon! Save the Date for GLOW - Dec. 10! GWL's Annual Glow Gala and Fundraiser is December 10, from 6:30 - 10:00 PM at Chester's, located at 60 Island Street in Lawrence. Each year the event grows and outshines the last because of the efforts of our fantastic volunteer Glow Planning Committee. We are currently seeking additional members, if you are interested in learning more about the committee please contact Heather. PS: The Glow Eco-Art Call to Artists has been released and is available on our website. Lawrence Farmers Market to Host DTA & DAR Joint Press Conference! This Wednesday, Sept. 16 at 1PM, you are invited to join Commissioner Scott Soares (Department of Agricultural Resources) and Commissioner Julia Kehoe (Department of Transitional Assistance) for a special announcement about a new partnership to bring increased EBT access to Massachusetts Farmers' Markets, followed by a free cooking demonstration. Spend $5, Get $5 Extra! Starting at 1:00, the first 25 SNAP participants to spend at least $5 in SNAP benefits will receive an additional $5 to make purchases at the farmers' market that day! Learn more. Join us and the City of Lawrence at the Official Ribbon Cutting for Lawrence's newest gem on the Spicket River Greenway - Manchester Street Park. Wednesday, September 16 at 3 p.m., please come to the park to help us celebrate! To support this park's construction, the City of Lawrence was awarded $500,000 in state funding from the Massachusetts Division of Conservation Services' PARC Program. 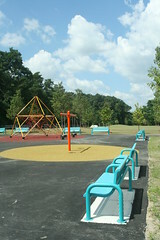 $190,000 in EPA Brownfields Cleanup grant funds supported the engineering and cleanup services associated with this brownfield-to-park project. The City matched both of these grant awards with CDBG dollars administered by the Federal government through the Department of Housing and Urban Development. In addition GWL was awarded $8,000 from the MA Office of Refugees and Immigrants through their Refugee Agriculture Program Services to support the construction of the community garden beds and the National Park Service awarded $10,000 to fund our time supporting the brownfields work. Stay tuned for updates on improvements and additions to this important new destination, the Spicket River Greenway -- Lawrence's emerging emerald bracelet. 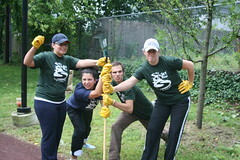 Join us for the 8th Annual Cleanup on Saturday Sept. 19 from 9 - 1. 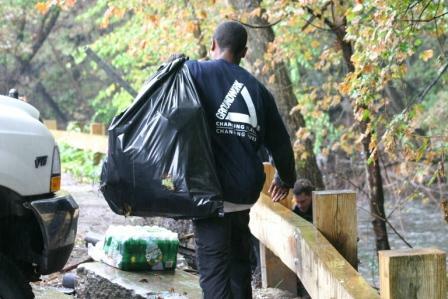 To-date volunteers have removed 82 tons of trash and over 1,000 tires from the Spicket River Greenway. This year we'll be based at Manchester Street Park (behind 75 Manchester Street) and then fan out to parks along the river. At the event, in partnership with the city's Dept. of Public Works, Lawrence residents will be able to pick-up Recycling Bins and learn about the City's new trash collection program being rolled out this fall! 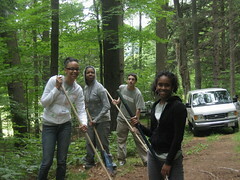 On Sunday Sept. 27 at 10am join us for a Green Team led hike through Lawrence's 120 acre wooded preserve, Den Rock Park. 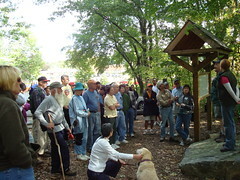 This hike is part of the 8th Annual ENHA Trails and Sails two weekends of walks and water. We encourage you to pre-register for this hike. The benefits of pre-registration include: email notification of schedule updates, create customized TRAILS & SAILS itineraries, Essex County's monthly ENews letter, and entrance in the TRAILS & SAILS prize drawing. Den Rock Park is located off of RT. 114, across from the North Andover Plaza. There is a parking lot at the trail head where we will meet. Please bring water and wear good sturdy shoes. Well-behaved, leashed dogs are invited. For other events taking place throughout Essex County visit the Essex National Area website.